The State of Testing report produced by Practitest is the largest testing survey worldwide. With about 1,500 participants from more than 80 countries, it aims to provide the most accurate information of the testing profession and the global testing community. 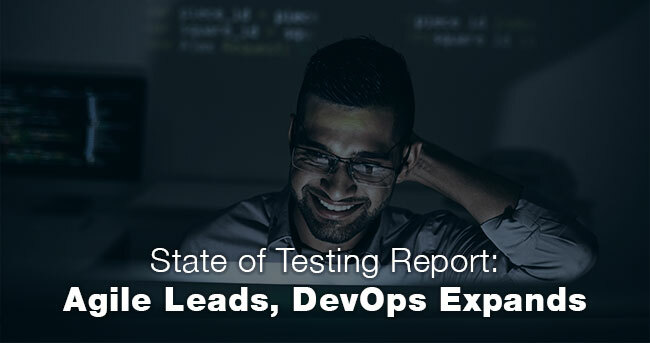 Held yearly, in collaboration with leading testing bloggers and thought leaders, the survey captures current and future trends. This survey is all about giving testers the ability to better understand their professional status compared to other testers and companies worldwide, and to be better prepared based on current and future trends. 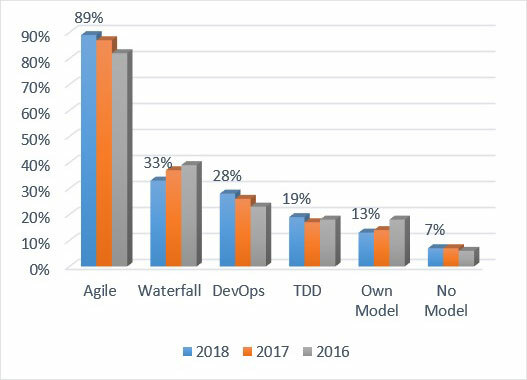 Agile is the dominant and almost universal model for software development, and DevOps usage expanding. 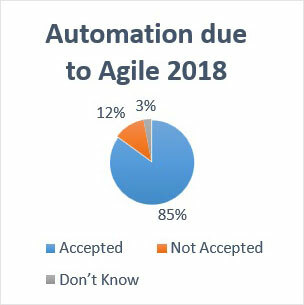 Agile adoption is getting close to 90%, with respondents working at least in some Agile projects within their organisations. This trend is continuing year after year. A certain percentage of projects still using the Waterfall model are also expected to transform to Agile methodologies with time. DevOps keeps growing, although at a slower pace than before. This year it reached 28% of respondents, following the previous increase. Adopting CI/CD in Agile is not like turning the ignition key to start an engine. Instead, it is a cultural change journey with numerous stops along the way. 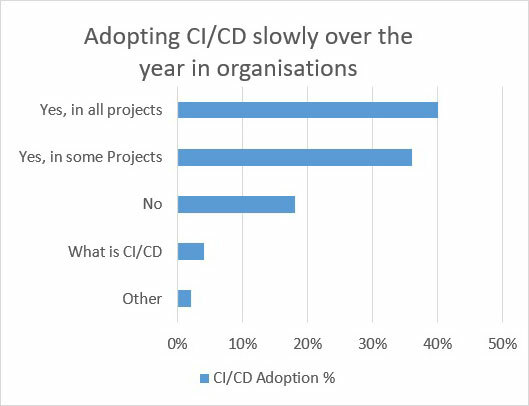 The chart reflects the 2018 survey of how CI/CD adoption is growing within organisations. In Agile, the team is more focused on customer collaboration over contract negotiation, which is measuring the success. Over the period, the benefits of Agile are being realised, and hence, expanding within the enterprise both more broadly and deeply. With an increase in projects adopting to Agile methodologies, test reports and dashboard usage have become prominent. Overall, we continue to see a constant decrease in the amount of formal testing documentation written. This shows a need to streamline testing all across the industry. A small trend around the decrease of ET and SBT, but it is still the preferred method of testing by a fair margin. A surprise point to note here is that people running scripted tests jumped up by 10% instead of continuing the decrease it started last year. It is not only about functional testing anymore. Organisations must adopt test automation to fit into the Agile world. Automation is a critical component to maintaining agility, and is a priority for the entire team through established practices/disciplines and a focus on continuous improvement. Agile is always about achieving better outcomes faster through the use of a dynamic, collaborative framework. When applied to software development/testing, automation has become an essential strategy for businesses to maximise the speed and effectiveness of agile delivery. Test automation allows testers to automate repetitive, tedious and time consuming fundamental tasks. 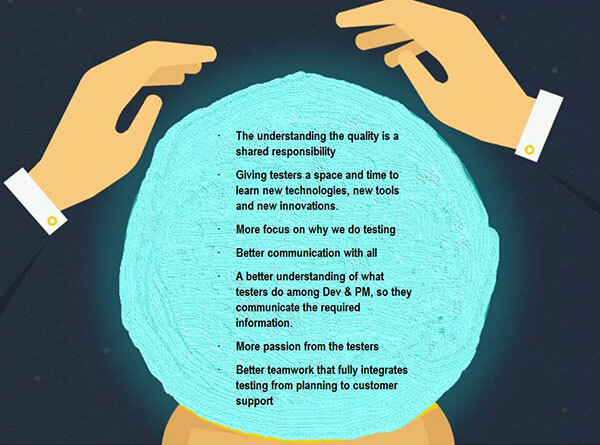 As detailed in the survey from the testers perspective, below are the changes they believe should be implemented to make the job better. As an Agile practitioner, below are the qualities one should have in today’s world of Agile. Excellence in these skills and competencies is what managers are looking for when hiring testers for their Agile projects. Is the testing profession gradually decling? The answer is “NO”, since we have more testers in our ecosystem than before, and there is a steady flow of testers coming into the profession. The need of testers has created the necessity for testers to diversifying their ways of working, looking for other value adding tasks to do in the context of our work. 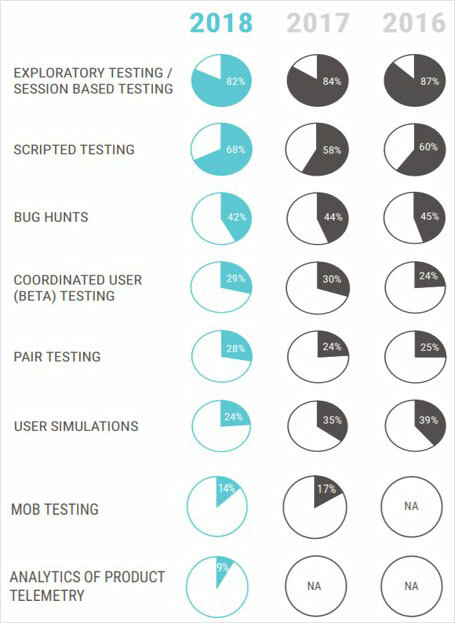 In parallel to this, and following the reality of our Agile world, there are many cases where as much as half of the testing work is falling to non-testers. This is a wakeup call to all of us, where we need to learn new skills in order to keep relevant in our quality roles. As at 2018, 90% of organisations practice Agile in some form, and the greatest benefits from adopting Agile were accelerated delivery, better project visibility, improved team productivity, and management of changing priorities. An interest conflict that we see in this article is the fact that doing less formal documentation in our work, but at the same time, testers are doing more scripted testing, and this appears to even come at the expense of the amount of Exploratory Tests (ET) done in their projects. ET is still the most common type of testing, but it actually decreased slightly this year from previous year’s report. It’s something to think about. One of the reasons could be that testers are struggling with session based testing as they have not been trained correctly, reverting back to old habits. With Agile creating the trend in software development, failure to respond to market changes can have a direct impact on your business. Planit’s consultants, Scrum Masters and Agile coaches can help in this journey by optimising, coaching, training and delivering quality products. Our Agile consultants have experience in quickly integrating into your team and collaborating to deliver on time, while our Agile practitioners can independently evaluate your organisation and provide advice on improving agile transformation. In essence, our experts can support your team in building effective Agile processes. If you are starting on your journey or feel that you are not getting the value from implementing Agile that you thought, contact us today to find out how we can help.